Online Forklift Certification, Get Your Forklift Operator Certification Online! Get Online Forklift Certification That is 100% OSHA-Compliant! If you’re looking for the most convenient and affordable way to get your employees trained and OSHA-compliant with online forklift certification, you’ve come to the right place. ForkliftCertification.com is the smart solution to any company’s forklift certification requirements, with convenient and cost-effective online forklift training. FLC will help your company with all of your OSHA online forklift certification requirements. From getting employees up to speed to ensuring you’re OSHA compliant, FLC has everything you need! Our online forklift certification provides a comprehensive, all-in-one training solutions for both employees and employers. Workers need OSHA forklift certification online in order to meet all local, state, and federal training requirements. Plus, employers are not permitted to knowingly have someone operate a powered industrial tuck without their forklift operator certification – online, in a classroom setting, or any other training method. Thanks to FLC, the leader in forklift operator certification online, you can become OSHA compliant quickly and affordably. It’s required by law. It’s extremely budget-friendly. And it just might save a life in the future. Sign up with FLC today! Our online forklift certification classes include a trio of classes for any skill level. Whether you’re a rookie forklift driver or veteran operator, you’ll find exactly what you need at FLC! Why Do You Need Forklift Certification? First of all, you may be thinking why you actually need a forklift certification. The best answer is, to protect the safety of you, if you’re an operator, or your employees if you’re an employer. Forklift accidents happen every day on worksites, and the number one cause is operator error. This means that untrained workers who aren’t prepared to recognize hazards and avoid accidents are the main reason for injuries, deaths, and damages involving forklifts. OSHA does not like to see untrained and uncertified workers performing risky tasks. The only way to protect yourself as a business owner is to invest in the credentials and paperwork that secure you and your business as a safety-focused establishment. 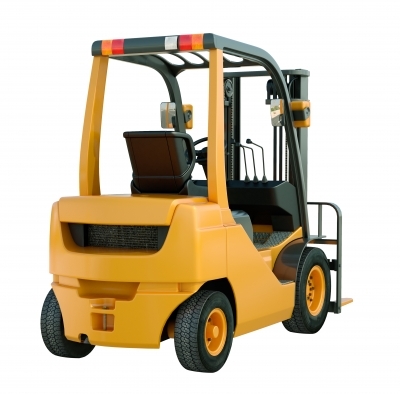 OSHA forklift certification online is a great way to get your employees compliant! Because forklift training and certification is so important, we’ve made it our mission to make it as easy and convenient as possible. Read more about our online forklift certification programs below! As an employer and business owner, you know how important it is to become compliant with all OSHA standards and regulations. Not doing so can result in thousands of dollars in fines, and devastating legalities to your business and reputation. Thankfully, we make it easy to train your entire work force and get everyone compliant, with our OSHA-compliant forklift certification online programs. All you need to do is create an account on our website, input your company name and training employees, and they’ll each have access to the self-paced forklift license online program from their own devices with internet. Both our online forklift certification training and our online trainer forklift certification program can be accessed 24/7 365. Forklift Certification is more affordable and schedule-friendly than ever with our online forklift certification courses! Getting your OSHA forklift certification online is a popular method for companies all across the United States. With strict compliance and training requirements, companies literally can’t afford to skip training. And with FLC’s flexible and accessible training format, there’s no excuse to delay your training any longer! OSHA has set strict rules for workers wanting to drive forklifts. However, these rules mostly apply to employers who hire operators in their business. According to OSHA, it is the employer’s duty to ensure every operator has received training and has proven to be competent as operating forklifts safely. If OSHA finds that any of your employees are untrained without the proper paperwork, and that it was known to you, you could be fined into the $100,000s! HR administrators, safety representatives and other employees responsible for implementing safety want a robust, comprehensive training program in place to handle their unique training needs. But rather than choose between the typical two routes of either creating your own training system and spending countless dollars and hours, or hiring a third party training company, choose an automated online forklift certification course that delivers the information you need at the cost and timeline you want. FLC will help you get OSHA forklift certification online, and it’s much more affordable than you think! With ForkliftCertification.com, businesses can enjoy an OSHA-compliant, expertly designed online forklift certification course for a trainer or regular worker. We offer a convenient online forklift training format with courses and training material that can be taken on any schedule, at a very affordable cost. Instant proof. Immediately, upon completion of an FLC online forklift training course, the certification papers are immediately available for your records. Simply insert into the employee’s file and they’re good to go. Don’t lose money on paid time off for employees. Allowing each employee to complete the forklift training on their own time means that you don’t have to lose workers to the classroom and have to compensate for paid time off. Keep productivity high at your business. Unlike paying for in-person classroom forklift training, our online forklift certification program keeps workers at their jobs during the work day, allowing your business to maintain productivity and keep making profits. Give each employee the individual training they need. It’s no secret that individual training is the best for ensuring workers are learning the important info they need and are retaining it. Our forklift license online program is self-paced and can be taken as many times as employees need to understand (and ace!) the content. • Train the Trainer Certification – This package is designed for employees who want to learn the knowledge needed to train other forklift operators. • Forklift Training & Certification Kit – This is our standard forklift training and certification kit. With our forklift license online course you will become a certified forklift operator. Learn and become certified to operate Warehouse Forklifts, Pallet Jacks & Order Pickers, and Rough Terrain Forklifts. • Forklift Certification & Training Bundle Package – This forklift certification online package offers the best value. It includes both training courses to become a forklift operator, and also a forklift operator trainer. If you’re looking for the best value and forklift certification online, go with the Bundle Package today! Our OSHA-compliant, online forklift training courses have set the industry standard since 2002. For well over a decade, FLC has remained a preferred provider for online trainer forklift certification and online forklift training. 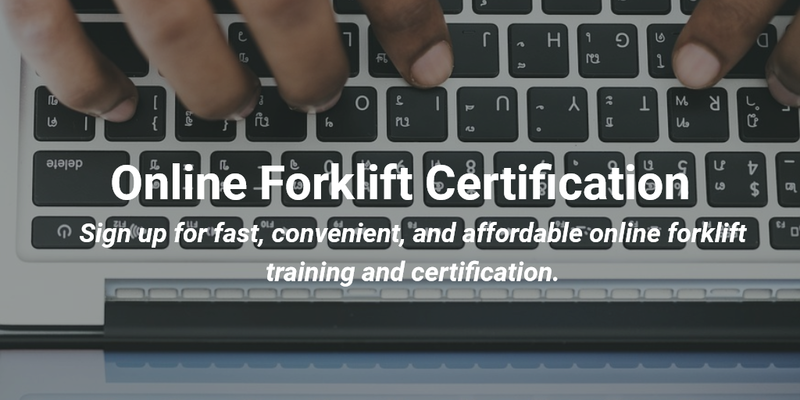 Choose FLC for Online Forklift Certification Today! Forklift training online is a smart alternative to traditional in-class sessions. Our online trainer forklift certification program can be accessed 24/7/365. Forklift Certification is more affordable and schedule-friendly than ever with our online forklift certification courses! Don’t put off your online forklift certification any longer. Enjoy all the benefits that come with OSHA compliance – sign up today and get started with your forklift operator certification online. Get forklift certification online for trainers and supervisors when you contact us today. On our contact page you’ll find a secure email portal to send a message, request an online forklift training quote, discover forklift certification online courses and learn how you can receive your forklift license online. Or, simply give us a call at (888) 278-8896. Our friendly and helpful customer service team can help you select forklift training available anytime, anywhere, thanks to convenient online access! Thanks for visiting FLC – we look forward to handling all of your online forklift certification requirements!